Thanks for stopping by on my day to host this wonderful cute book. Below you will find information about the book as well as a chance to win a copy! We are happy to be touring this funny book by author Shepherd Hoodwin! Shepherd Hoodwin has been channeling the Michael entity since 1986. He also does intuitive readings, mediumship, past-life regression, healing, counseling, and channeling coaching. He has conducted workshops on the Michael teachings throughout the United States. He is also the author of The Journey of Your Soul: A Channel Explores Channeling and the Michael Teachings, Meditations for Self-Discovery: Guided Journeys for Communicating with Your Inner Self, and Loving from Your Soul: Creating Powerful Relationships. Upcoming titles include Opening to Healing Energy, Growing Through Joy, and Being in the World. Shepherd is a graduate of the University of Oregon in Music. He lives in Laguna Niguel, California. So please check it out and have a great time! This is perhaps the first metaphysical/self-help humor collection, designed to appeal to Oprah and Dave Barry fans as well as those with more esoteric interests. In a style reminiscent of comedian Steven Wright, it s full of wry one-liners along with longer, hilariously mind-bending pieces on a wide range of subjects, tied together by the idea of clueless humans trying to find enlightenment. With its fall release, it will be a great holiday gift for anyone who loves to laugh. It s perfectly timed to take advantage of worldwide anticipation of 2012, the legendary end of the Mayan calendar, which is a recurring theme in the book. 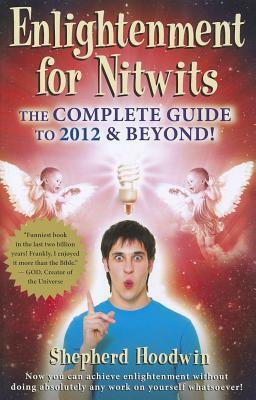 "ENLIGHTENMENT for NITWITS" is the funniest book I have read in several decades. Without quoting the book, it is difficult to recognize its utter simplicity: "If you're not in absolute bliss by the end of it, you might want to increase your meds." "If you're reading this before the invention of the printing press, be advised it is forbidden to interfere with the course of human history." Everything, from his grandmother's urine and feces samples, beautifully gift wrapped and left on the train, to blowing it by having a thirty second negative thought, is the name of the game. Nothing is sacred. "Sometimes you have to spend another $3 at Walmart to get class and elegance." You can defend to the death your right to shop naked or you can buy the book and enjoy 223 pages of delightful spoofs. --C. Norman Shealy, M.D., Ph.D., author of "Life Beyond 100"
Shepherd Hoodwin has been channeling the Michael entity since 1986. He also does intuitive readings, mediumship, past-life regression, healing, counseling, and channeling coaching. He has conducted workshops on the Michael teachings throughout the United States. He is also the author of The Journey of Your Soul: A Channel Explores Channeling and the Michael Teachings, Meditations for Self-Discovery: Guided Journeys for Communicating with Your Inner Self, and Loving from Your Soul: Creating Powerful Relationships. Upcoming titles include Opening to Healing Energy, Growing Through Joy, and Being in the World. Shepherd is a graduate of the University of Oregon in Music. He lives in Laguna Niguel, California. Hey... Wanna See My Indies? Enter to win! 3 Print Copies of the book!